Subaru cleared dealer lots of its 2013 Forester by using "Compare 2014 RAV4, 2013 CR-V vs. 2013 Forester" Google ads to make way for new 2014 Forester. In a shrewd marketing move by Subaru, the Japanese automaker used Google, Honda CR-V and Toyota RAV4 to clear their existing 2013 Forester inventory to make way for the all-new 2014 Forester SUV. While most automakers use more traditional avenues like giving big discounts and expensive TV ads, Subaru used Google pay-per-click advertising and ad retargeting to accomplish their goal. How did Subaru use the Honda CR-V and Toyota RAV4 to reduce inventory? The digital marketing money was well spent as the Google ads worked for Subaru of America. Evans said Subaru increased spending on the online marketing in the first quarter to $4 million from about $2.5 million in the fourth quarter of 2013 to help move the 2013 Foresters. On January 1 of this year, Subaru still had 17,000 2013 Foresters on dealer lots in the U.S. According to Evans, in the last week of March, inventory was down to about 2,000 2013 Foresters. And Subaru expects to sell out of the remaining 2013 Foresters in the next two weeks. Subaru also advertised on Consumer Reports who have had favorable reviews of the new 2014 crossover. Evans said they also offered 0 percent financing in the first quarter to help clear the 2013 Foresters. As the remaining 2013s move off dealer lots, it’s just in time as Subaru launches the all-new 2014 Forester here in the U.S. The brand is counting on the 2014 model to keep sales at an all-time high. The medium-size SUV segment is the most competitive in the industry and Subaru is working hard to be number one. In the highly competitive segment, the new 2014 Subaru Forester, 2013 Toyota RAV4, 2013 Honda CR-V and 2013 Mazda CX-5 are all in the mix for buyers looking for a new mid-size crossover. With the four vehicles so close in comparison, is there a clear winner in the segment? The Daily Telegraph’s Carsguide, Paul Gover, Australia’s most experienced and respected road testers thinks so. See the review here. The new 2014 Subaru Forester has been introduced in the U.S. and around the globe with much improved new engines, improved fuel mileage and new high-tech features. Subaru is looking for the all-new fourth-generation crossover to sell in even greater numbers than the outgoing model. 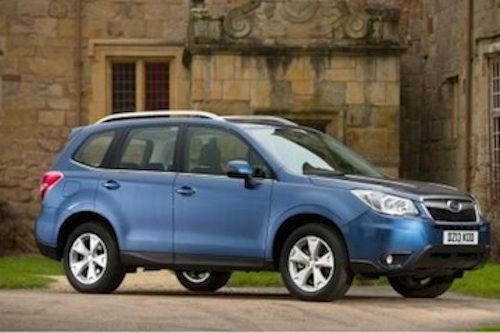 As they compete with the 2013 Honda CR-V and 2014 Toyota RAV4, look for the new 2014 Subaru Forester to be a big hit not only in the U.S., but around the globe.